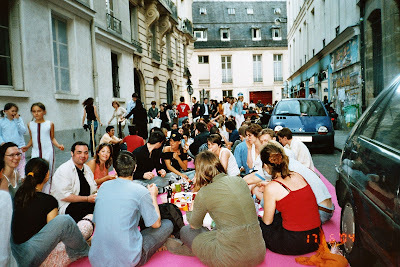 This picnic in the street was organised by the inhabitants and shopkeepers of the 7th 'arrondissement' (neighbourhood) of Paris; traffic was halted, flashy pink rugs covered the streets, and the inhabitants (including the students of my grad school) sat in the middle of the road, sharing a bite with their neighbours, in one of the most charming (and tasty) 'community-building' experiences I ever had! Oh I love Paris for this kind of thing! Is this a common thing that happens in Paris? Interesting!